Greetings again from the darkness. Tis the season for the revival of two extremely successful and popular film franchises, each nearly 40 years old. Both stay true to their roots. For Star Wars that means big budget and ground-breaking special effects, while for Rocky, that means a personal mission and Sly. Writer/director Ryan Coogler and his Fruitvale Station (2013) star Michael B Jordan unite with the Italian Stallion himself, Sylvester Stallone, to add another chapter to a story we all thought concluded with Rocky Balboa (2006). Thirteen year old Adonis Johnson is an angry boy who doesn’t shy away from fights. While being held in a juvenile detention center, he is visited by a woman named Mary Ann (Phylicia Rashad); she adopts him and fills in the gaps of his family tree. Adonis is the illegitimate son fathered by Apollo Creed, the champion boxer who died during Rocky IV. Mary Ann is Apollo’s widow and she plops Adonis into her world of affluence, and sets him up for a career in finance. Of course, thanks to YouTube, Adonis studies his dad’s old fights and promptly sneaks off to Tijuana to test out his own boxing skills. It’s a foregone conclusion that Adonis will persuade his father’s old adversary/friend to train and mentor him, and just like that, the owner of Adrian’s Restaurant slips into a similar role made famous by Burgess Meredith. That’s right; Rocky Balboa becomes the Mickey to Adonis … right down to the (slower) chickens. Sure, it’s a bit formulaic, but that’s the idea behind a franchise. We have a history with Rocky, and know that he is basically a sweet guy who thrives on competition. Here, he has to tame a wild, self-trained young boxer who is connected to him through history. The film does so many things right that it’s easy to forgive the missteps. Adonis’ love interest is a young singer named Bianca (Tessa Thompson), who easily could have had a more substantive role in the story – in fact, it’s a bit disappointing when she disappears for long segments. Also, there is a medical/health sub-plot that comes across a bit contrived and serves only the purpose of putting Stallone’s role on more equal footing with Jordan’s. Minor qualms, but annoyances just the same. What the film does right is create a terrific synergy between Rocky and Adonis. It’s a bond both men need, though for different reasons. Stallone is so good as the aging Rocky that it’s reason to forgive and forget his many cinematic foibles over the years. Also, the boxing cinematography from Maryse Alberti (The Wrestler, 2008) is stunning … especially her extended long take in the ring during Adonis’ first professional fight. For the final fight, Adonis dons a special pair of trunks and takes on the nasty, thunderous punches of “Pretty” Ricky Conlan (played by boxer Tony “Bomber” Bellew), providing some of the most realistic cinematic boxing scenes (right there with Southpaw from earlier this year). 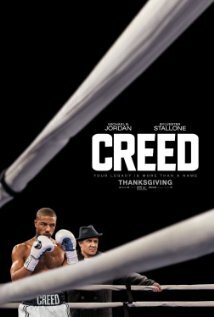 It’s a relief that Mr. Coogler and his co-writer Aaron Covington avoided the expected cheesiness, and instead focused on the intimate personal stories while also paying tribute to the legacy of the franchise … Bill Conlon’s original score is heard at least once, the Philadelphia MOA steps have their moment, as does the Rocky statue that draws fans and selfies. Heck, there is even a disclosure of who won the Rocky III fight between Rocky and Apollo. It’s that kind of nostalgia that complements this modern story and contemporary character. This entry was posted on Wednesday, December 23rd, 2015 at 8:48 pm and is filed under Drama. You can follow any responses to this entry through the RSS 2.0 feed. You can leave a response, or trackback from your own site. I enjoyed it. I was happy it did not overdo what it could have and instead stayed sober, well for a Rocky sequel. Rocky became the Mickey, just like a son becomes the father, indeed. I’m surely not the only one felt old watching this chapter of the franchise, but that’s life. Ray, I expected the worst going in, but was more than pleasantly surprised. Coogler looks like he is going to be a director to follow.